“There can be only one.” Never has a tag line been so wrong like this one, and it would be even more fun if Highlander turned out as a MMO. “There can be only one... thousand or so”, it would probably say. Kalisto was developing this before they closed down, but expectations were actually pretty low. 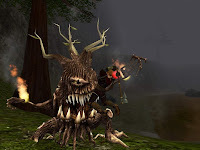 Only a few developers managed to be successful on their first MMO game, and Kalisto didn’t exactly had any massively multiplayer online track record. It would rock because: There’s something oddly appealing and stylish on a sword fighting MMO with a Scottish accent, and if they could add some Queen music and even a character looking like Sean Connery, all the better for it. And since there’s a Highlander remake to be released in 2010, now would be a great time for someone to pick up the project. 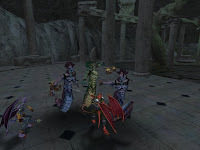 Marvel Universe Online is... was a MMORPG developed by Cryptic Studios, the team behind successful game City of Heroes. They had the experience, the rights, the will... so, what failed? Official word from Shane Kim, the head of Microsoft Games Studios, blames the competitive market for subscription-based MMO, but it sounded like a weak excuse. Anonymous sources speak of disagreements between Microsoft and Marvel regarding the licensing of Marvel characters, which led to the cancellation. Now there’s a good reason! It would rock because: We’ll give you four reasons. Spider-Man. Hulk. X-Men. Captain America. Do you need more? Well, not all was lost, since Cryptic acquired the Champions licence and released Champions Online, and there’s a DC Universe Online in development. As for Marvel fans, it seems they have to wait until 2012 to play with their favorite characters. 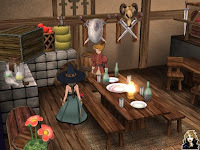 The expertise of Level-5 (Dragon Quest VIII, Rogue Galaxy) at the service of Microsoft for True Fantasy Live Online looked like an amazing prospect. It was highly anticipated and could be the game that would boost sales of the original Xbox in Japan. It ended up canned in June 2004 due to technical problems and the poor relations between developer and publisher. Since 2008 there’s some talk from Level-5 about the desire to resume work in the game. It would rock because: It’s Level-5, one of the most talented teams in the world. They know their RPGs, and the cartoon look of True Fantasy Live Online was amazing. This is one of the best MMORPGs that was never released. Ultima X: Odyssey was supposed to follow on Ultima IX and coexist with Ultima Online. It was scheduled for 2004, the same year Electronic Arts decided to cancel it, in a troubled period where other EA MMOs were also dropped or had serious problems: Earth & Beyond, The Sims Online and Motor City Online. The cancellation had something to do with EA acquiring Origin Systems and the consequent layoffs of several employees. It would rock because: The mythology is strong and appealing, the player base seemed huge, and Origin was a talented developer. It was a time when there was no such expression as “Oh no! Not another Fantasy MMO!” and it could well find its place.